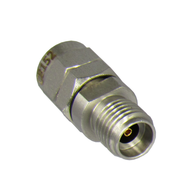 These 1.85mm coaxial adapters,with metric threads, will mate with 2.4, but not sma, 2.92, or 3.5 which use english threads. The Frequency of 1.85mm adapters is either 65 or 67ghz; standards committees just switched to 67ghz. 1.85mm adapters fill the frequency gap between 2.4's & 1.0's. The 1.85 connector is sometimes referred to as a "V" connector. Hex size is 5/16, the same as many other precision connectors. 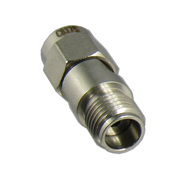 1.85mm to 1.85mm adapters are usefull as connector savers & hooking up different 1.85 systems. 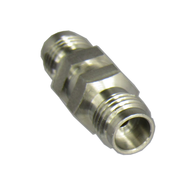 Please click on a link from the drop down menu above to find the exact 1.85mm coaxial adapter you need.